Are you a singer songwriter? Do you struggle to finish your ideas or flesh them out into full productions? Today I’m bringing on my buddy Joe Gilder, a talented engineer and singer/songwriter from Nashville to help us think through some strategies for turning a simple guitar/vocal or piano/vocal song idea into a full blown finished production. Sound is the worst. But finishing songs is a huge deal. Everything has to be perfect. But once it’s perfect the sound is amateur. So maybe that’s my underlying excuse for not finishing songs. My goodness sound for me, has always been a thing in my side. But thank you for your wisdom and knowledge. You’re not alone Brett. We’ve all struggled with that. Nice, now I don’t feel so all alone! Great stuff as always guys – I hit rises and slumps periodically – I’m sure many can relate. This was the shot in the arm I needed. Thanks for being legit educators and motivators! Do I DARE SAY that I will endeavor to have an EP out by next April? ” and the drummer is getting all excited about the demo track and WRITING DOWN IDEAS” to play counterpoint to what he is hearing on the demo track. WRITE DOWN YOUR IDEAS WHEN THEY HAPPEN. It’s so easy to get caught up in the moment but when you need to go back and edit and start really tweaking you may not remember that “Moment” and it could be EXACTLY what that songs needs. Another trick of mine that goes with what Joe says about starting out with a groove if you have trouble programing drums. I use software called Band In A Box, but NOT AS A DAW. It is essentially my “Scratch Pad” for arrangement ideas. Often I won’t even use all the tracks the software creates. Often I will start a new project with just guitar and piano and then go and audition all the different “Real Drummer” Styles and individually download what I like and edit later in my DAW. And with Studio One it has their amazing drum machine called Impact which almost never fails me for just the right sounds to use…and that makes it so much easier to program drums. The combination of these two software platforms and a little patience makes for a wonderful result almost every time. A “Trick” I learned from a gentleman who works exclusively with Sync Licensing… every eight bars make it just a little bit different. Don’t just copy paste a drum fill loop… or subtle orchestration sampling… not BIG AND SLAP YOU but just a lttle itty bit of something to keep the interest going. And Orchestration and strings were the original “Pads” as we do now so why not? Nice. I tend to play every thing myself for a rough mock up. Each time I record a new part I revise the previous one, like a sculpture. The best part of this is the soul that gets captured. I have decided to always collaborate with others. It brings so much life. Anyways, if any of you want affordable good 4 track drums you can contact me! Thank you for your excellent video. Which on-line site(s) would you recommend for finding and hiring a good solid drummer/ bass player for your track and how do you choose which one is the right one for your job? There is a very cool music collaboration site called Kompoz (kompoz.com). It’s all about musicians, songwriters and engineers helping each other out with their songs. The members are from all over the world, all different genres and skill levels. You quickly find your water level, so to speak, and also your group of members that become your “go to” posse. And I’ve never paid a cent (or been paid) to have folks play on my tunes. In addition, I feel as though I’ve made quite a few dear friends along the way. For me, I write tunes that consist of mainly voice, guitars and sometimes bass. Once I get those elements recorded I recruit one of my go to drummers, and ask for other textures such as keys, etc. from the whole pool of Kompozers. Dozens of times I have been pleasantly surprised by the creative tracks that were sent to me – ideas that I would never have thought of on my own! Oh, and when a collaboration is started, the originator declares how the songwriting and performance rights will be split. Might be worth checking out for your subscribers. Thanks for all that BOTH of you do!!! 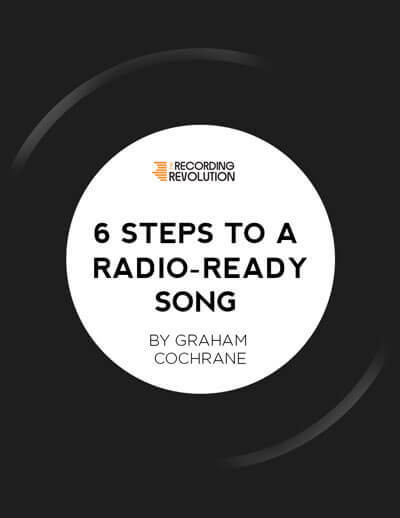 Graham, and Joe, this is so great of you to do this for aspiring music makers out there. One thing, though, that I really think is missing from most if not all the tutorials about songwriting and arranging is the value, I would say importance of knowing at least the basics of music theory and composition. If you’re trying to flesh out a song and record it, but don’t know anything about keys and modes, you are missing the tools that allow you to take what you hear in your head and bring it into the audible realm. Otherwise, it’s trial and error, or reliance on cliches that make all your songs sound the same. And I’m not necessarily talking about classes or books — some people come by this intuitively by analyzing the music of their favorite recording artists. Yes, you can name many artists, especially in rock, who were not “classically trained,” but you can bet they knew how to take a musical idea and make it real, or they had a producer who did. I like to use The Beatles as an example. They obviously had excellent intuitive knowledge of chord relationships and melodic coherence, but they achieved real success only with the help and teaching of producer George Martin, a skilled musician and composer. I’m not trying to discourage, I’m trying to encourage people to learn music! Otherwise, you’re painting with only primary colors and only one brush. I agree. The more you know about music and theory the more “tools” you’ll have at your disposal. Thank you both for the video. On the topic of panning, you mention panning full right, full left and center. Is panning some parts in between these extremes, say at 25% or 50% a valid mixing option? Or is it too subtle of a difference in the placement of a part in the stereo spectrum of a modern pop song to matter or to bother doing? Thank you for considering my question. Certainly valid and I do it regularly. Just not for many tracks. I tend to have the majority of tracks either left, center or right. Wow! Best video ever! Confirmed a lot of ideas and thoughts I have about production and how I go about building arrangements but so well articulated and so helpful! You guys are great!!! Love the stuff about panned counterpoint melodies!! !